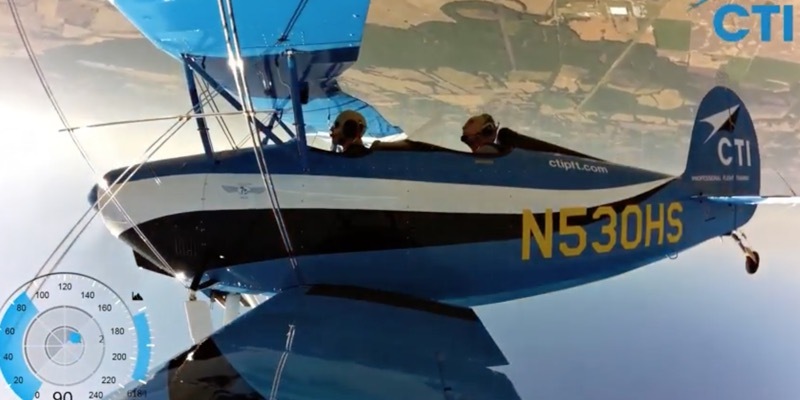 Could a Biplane Discovery Flight be for you? If you want to experience the thrill of the skies on an aerobatic adventure, a Biplane Discovery Flight could be just what you’re looking for! At CTI Professional Flight Training, we offer Discovery Flights for those who are hungry for their first taste of aviation. And, if you’re visiting us at our Tennessee location, we’ll give you an unforgettable experience in Baby Blue, our beautiful biplane! Even if you’ve never flown before, you’ll have the chance to take off with a fully qualified flight instructor, feel the rush of the wind in your face, and experience pure exhilaration as you take to the skies over Millington. You’ll see what it’s like to be in the pilot’s seat as you undertake rolls, loops and more, experiencing forces of 3g – the same as an astronaut during a rocket launch! You’ll begin by climbing into Baby Blue – our WACO Great Lakes 2T-1A-2 – and taking the front seat as your instructor climbs in behind you. We’ll then roll you out of the hangar, and once you’re on the runway, you’ll be ready for take off! Once off the ground, you’ll soon understand the exhilaration of a Biplane Discovery Flight. And once you’ve reached the right altitude, your instructor will introduce you to the maneuvers – before handing over the controls to you! Jon is one of those brave fliers who took up the challenge. Even though he had no small aircraft experience before beginning his Biplane Discovery Flight, after a short time in the sky he was ready to try a Half Cuban Eight – a combination of maneuvers involving a loop, a roll and a pull back to level flight! And with your instructor behind you, in charge of the technical details like the altitude and airspeed, you’re left free to concentrate on executing those electrifyingly fun spins, rolls, and loops! Imagine taking off having never flown a plane before, and landing back down on the runway having completed moves you’ve only seen before in air shows. That’s precisely the experience we’ll give you when you book your Biplane Discovery Flight – so why wait? They also make great Christmas gifts!